A focus on wellbeing and happiness in social discourse has necessarily raised questions about how to appropriately measure and manage wellbeing, and about the validity of reported subjective experiences. Historically, objective measures have monopolized the arena of wellbeing, as it was believed that a single measure, like GDP, income, education, or crime rates accurately reflected a state of psychosocial prosperity in nations. More recently, a sole reliance on such indicators is increasingly being discouraged. Governments are urged to consider wellbeing and happiness a public good and not a private individual matter. In this chapter we discuss why it is important to measure the subjective aspects of wellbeing and how a theoretical orientation can help in this regard. We propose tools to develop a dashboard and present a number of best practise recommendations gleaned from the empirical literature. While we target recommendations at government bodies, we encourage corporations, organizations, educational institutions, and health care providers to follow suit and include the collection of wellbeing data in their efforts. Bakker, A., Burger, M., van Haren, P., Oerlemans, W., & Veenhoven, R. (2015). Happiness raised by raising awareness: Effect of happiness using the happiness indicator. EHERO Working Paper 2015/01 310714-01. Retrieved from https://personal.eur.nl/veenhoven/Pub2010s/2015i-full.pdf. Bronsteen, J., Buccafusco, C., & Masur, J. S. (2014). Wellbeing and public policy. Coase-Sandor Working Paper Series in Law and Economics No. 707. Retrieved from http://chicagounbound.uchicago.edu/cgi/viewcontent.cgi?article=2395&context=law_and_economics. Evans, B. F., Zimmerman, E., Woolf, S. H., & Haley, A. D. (2012). Social determinants of health and crime in post-Katrina Orleans Parish. Richmond, USA: Virginia Commonwealth University Center on Human Needs. Retrieved from http://www.societyhealth.vcu.edu/media/society-health/pdf/PMReport_Orleans_Parish.pdf. Frey, B. S., & Stutzer, A. (2007). Should national happiness be maximized? Zurich IEER Working Paper No. 306. Retrieved from http://econpapers.repec.org/paper/crawpaper/2006-26.htm. Frey, B. S., & Stutzer, A. (2017). Public choice and happiness. CREMA: Center for Research in Economics, Management and the Arts Working Paper No. 2017-03. Retrieved from http://www.crema-research.ch/papers/2017-03.pdf. Gallup. (2017). Gallup 2017 global emotions report. Retrieved from http://news.gallup.com/reports/212648/gallup-global-emotions-report-2017.aspx. Gundlach, E., & Opfinger, M. (2011). Religiosity as a determinant of happiness. GIGA, German Institute of Global and Area Studies Working Paper No. 163. Retrieved from http://repec.giga-hamburg.de/pdf/giga_11_wp163_gundlach-opfinger.pdf. Helliwell, J. F., Layard, R., & Sachs, J. (2012). Some policy implications. In J. Helliwell, R. Layard & J. Sachs (Eds. ), World Happiness Report (pp. 90–107). Retrieved from http://worldhappiness.report/download/. Kinderman, P. (2015, September 28). Why are governments interested in our wellbeing? World Economic Forum. Retrieved from https://www.weforum.org/agenda/2015/09/why-are-governments-interested-in-our-wellbeing/. Lambert, L., Passmore, H.-A., & Joshanloo, M. (2018). 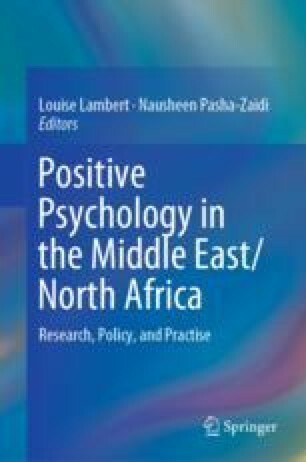 A positive psychology intervention program in a culturally diverse university: Boosting happiness and reducing fear. Journal of Happiness Studies. https://doi.org/10.1007/s10902-018-9993-z. Nikolova, M. (2016). Happiness and development. IZA Discussion Paper No. 10088. Retrieved from https://ssrn.com/abstract=2819369. O’Donnell, G. (2013). Using wellbeing as a guide to policy. In J. Helliwell, R. Layard & J. Sachs (Eds. ), World Happiness Report 2013 (pp. 98–111). Retrieved from http://unsdsn.org/wp-content/uploads/2014/02/WorldHappinessReport2013_online.pdf. Organisation for Economic Co-operation and Development (OECD). (2013). OECD guidelines on measuring subjective wellbeing. Paris, France: Organisation for Economic Co-operation and Development. Retrieved from http://www.oecd.org/statistics/oecd-guidelines-on-measuring-subjective-wellbeing-9789264191655-en.htm. Stiglitz, J., Sen, A., & Fitoussi, J.-P. (2009). The measurement of economic performance and social progress revisited. Commission on the Measurement of Economic Performance and Social Progress, Paris. Retrieved from http://www.ofce.sciences-po.fr/pdf/dtravail/WP2009-33.pdf. Wallace, J., & Schmuecker, K. (2012). Shifting the dial: From wellbeing measures to policy practice. Retrieved from https://www.carnegieuktrust.org.uk/carnegieuktrust/wp-content/uploads/sites/64/2016/02/pub1455011624.pdf. Weijers, D. M. (2014). National accounts that make governments more efficient by making them more accountable. Retrieved from http://www.danweijers.com/. White, S. C. (2009). Analyzing wellbeing: A framework for development practice. Working paper. Bath: University of Bath/Wellbeing in Developing Countries Research Group. (Wellbeing in Developing Countries (WeD) Working Papers; WeD Working Paper 09). Retrieved from http://opus.bath.ac.uk/13944/.